A look at some of the early feedback received on the Smithsonian's pilot of a history game, The Mystery of the Meghatherium Club: Mayhem and Mustaches. The Castle halls were alive with adventure this summer! From July 7th to August 27th, we piloted a live game for teens, The Mystery of the Meghatherium Club: Mayhem and Mustaches. The weeks leading up to launch day were full of testing and refining the game with our teen co-developers, making sure security wasn't alarmed by the keys and boxes hidden around the Smithsonian's Castle, planning for how the game would run if there were special events, and training the 20 teen volunteers who were to serve as game masters. Our goals were to provide teens with a more engaging experience at the Castle, and to spark their interest in history. While we haven't dug into all the visitor surveys yet from the nearly 500 over 350 visitors who played, based on observation, a history-based game indeed livened-up the public areas of the Castle, and players of all ages were delighted to be able to do something a little different from what they expected in a museum setting. One adult who played the game with her nephews said the kids were energized post-game, and they had one of their best dinner conversations ever. 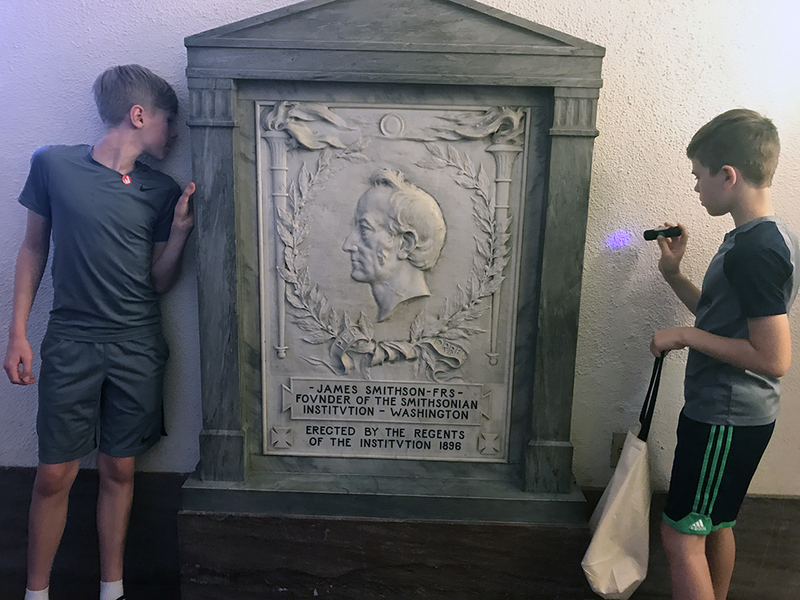 The mother of one family from South Dakota signed up for the game because it broke up the rhythm of their family trip to Washington D.C. and gave her kids something to do other than view one exhibit and monument after another. It seemed like the whole family had fun exploring corners of the Castle, especially with the black light. Another family who played during testing said they had better conversations as a family after playing the game which is an unintended result, but wonderful nonetheless. When observing, I always held my breath at the start of the game, after the teen volunteers gave the introduction and sent players off to look for their first clue. Would they be brave and look behind the display cases, which upends the traditional way of behaving in a museum; look, don't touch. Inevitably, they would find the hidden box with exclamations of "Oh!" or "Cool!" From that moment on, they were hooked and relished discovering a hidden clue. The game lasted an hour and there was a sense of urgency to finish before the clock was up. My favorite surprise result of the game was the role that the teen game masters played throughout the pilot. 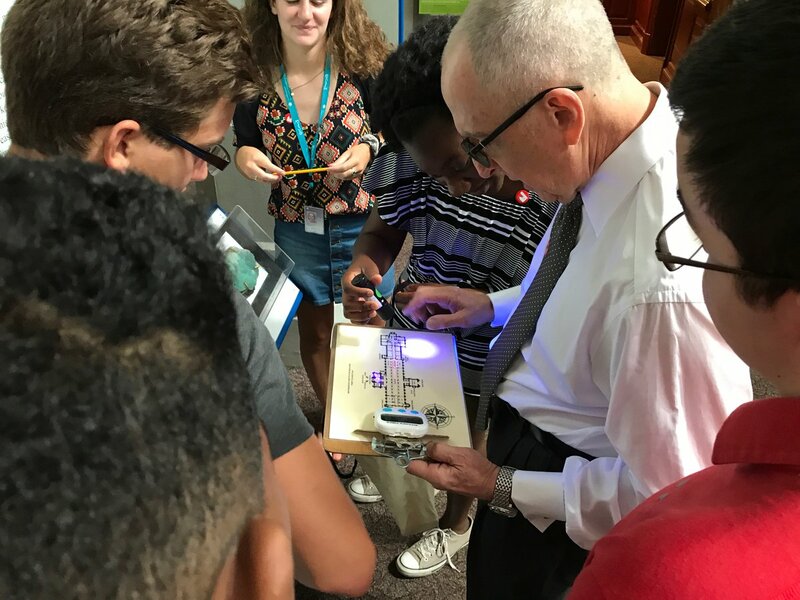 First, it was great to see the way teens worked with the visitors, helping out younger kids and making people feel welcome to the Smithsonian. Second, they took ownership of the game experience and ran around the Castle to make sure everything was running smoothly. 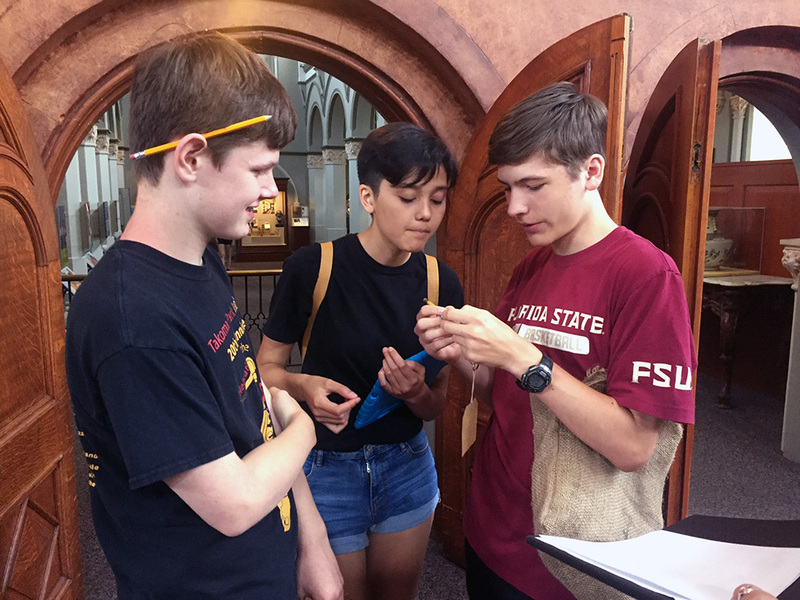 It turns out that when you offer a free game, there are a lot of last minute no-shows, so the teens met the challenge and recruited game players on-the-spot. When I asked one teen volunteer what he got from the summer pilot, he said, "Definitely how to work in a team, and communication." In the coming months as we examine the feedback in-depth, we'll update you here on what we learned so you can create your own history mystery! "Mystery of the Megatherium Club: Mustaches and Mayhem"